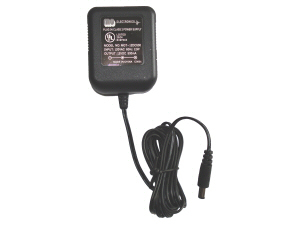 This 12VDC 500mA power adapter is designed to provide power for 1 CCTV security camera or microphone. Simply plug this power adapter into a wall outlet, then connect to your pre-made power/video or power/audio cables, to provide power out to your equipment. These power adapters are designed to be easy replacement for failed CCTV power supplies for all different systems with 12 Volt DC requirements. These power adapters can be used with bulk Siamese RG-59 cables as well, simply add an AW-21M connector, which will accept the power from this power adapter and convert to a bare wire connection to connect into the bulk spool of power cable. This power supply was a good replacement for on that had failed on my camera system from years ago. Easy plug in.